Published by Prometheus Books, USA,2004, PP 209. With an introduction by N.Innaiah: Comprehensive thought developed by M.N Roy on Humanism, first time introduced in the western world. The political journery of the state was traced from 100 years. During British regime in Andhra Area and under Nizam`s rule in Telengana things were different. The caste wars under Justice Party administration early 1920s and 30s was discussed. The Politicians role in various parties both before Independence and post Independence days depicted vividly. Each Chief Minister played pivotal role in the state. 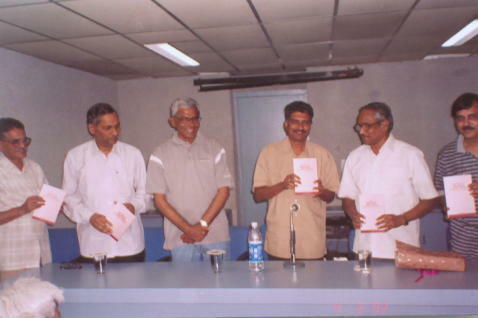 the chapters were divided with Chief Minister as key persons.Telengana and Andhra areas fought for seperate statehood, which ended with political gimmics and people were fooled who fought and sacrificed their lives.the lists of state and central ministries,political heriditary aspects will reveal many things. Evelyn Trent was the first wife of M.N.Roy. She played important role in his early life. She was mentioned as one of the founder member of Exile Indian Communist Party, started at Tashkent during 1920s. She adopted the pen name Santhi Devi and contributed articles in Internataional journals run by M.N.Roy. She was stanford graduate, followed M.N.Roy and married him much against the wishes of her parents. She was in Russia, Mexico, Europe from 1917 to 1925. M.N.Roy deserted her in 1925.Evelyn left to USA and settled down in California,USA confining to odd jobs and maintaining low profile.she corresponded through prof Robert C. North only. she never said anything bad about M.N.Roy later. M.N.Roy wrote his autobiography but ignored Evelyn which is unfair. Mr.N.T.Ramarao, matinee idol of Andhra Pradesh came into politics and swept away the established ruling Congress party from power. He promised clean government and voted to power within 9 months of canvass. A comparitive study of Congress government in Andhra Pradesh and the new regime of N.T.Ramarao as chief Minister observed.Mr.N.T.Ramarao adopted saffron dress for a short while, imitated Vivekananda, the monk of Ramakrishna order and attracted people with his promises. This is between 1982 to 1986. Mr.N T Ramarao as chief minister changed his dress from traditional shirt,pant to Ochre Robe. Later he imitated some monks. But that lasted only few months. He switched over to normal life and thus proved that he was no different from other politicians in promises and performances. It is a curious factor that people can be cheated for short period to gain votes and power. Ph.D Thesis accepted by Osmania University. The discussion is based on modern scientific developments in space-Time, Causality, Modern Biology, New Quantum Theory, Law of Thermodynamics and Determinism.An attempt was made the reconcile Freedom with Determinism. Mr M.V.Ramamurthy late Humanist, Advocate had written details of the case in deciding the Ph.D Thesis in Osmania University. A mischeous role was played by a devotee of Saint Aurobindo in procrastinating and delaying to confir the degree. Osmania University had no clear cut rules . The High Court of Andhra Pradesh ordered the university to follow rules and confir the degree based on the examiner reports.Justice Parthasarathy also in his scathing criticism passed remarks against the guide Dr (late) V.Madhusudan Reddi who played mischief with the scholar. All these curious facts were brought out by Mr.Ramamurthy. Numerous political parties were born and died both before Independence and after Independence in India. All parties are born with some aim and objective, though the main aim is capturing the power. Leaders who differ from others, or who fail to gain key posts in the party also formed different parties. It was a long list. The political party formation game is still on in India. the list is not exhaustive. This covers until 1982 only. All political parties aim at gaining power by any means. For them the end justifies the means. The Manifestos are made to lure voters. In power all parties behave more or less in the same way. Detailed study was made based on the politics of Andhra Pradesh State. this is applicable to all other states more or less with degree of difference. This is meant to be a text book for graduate students. The matter covers a century of politics and parties in Andhra Pradesh with references. It traced the trends from pre Independence days till 1985 when N.T.Ramarao came to power dislodging the congress party, which ruled the state for 30 years. It is mimeographed copy. Library of Congress has a copy of it. Politics in Andhra Pradesh both pre Independence and post Independence days depicted here clearly. All nuances of political parties,agitations and castes were discussed. This slim volume was the result of a seminar conducted by the committee of cultural freedom at Hyderabad. Alam Khundmiri, reader in Philosophy, Osmania University and myself collected the articles from literary persons to expose the trends in both languages and areas. The articles in this volume were organised to show the evolution of Humanism in east and west. This volume was produced the author . Eminent humanists like Paul Kurtz contributed to this volume. 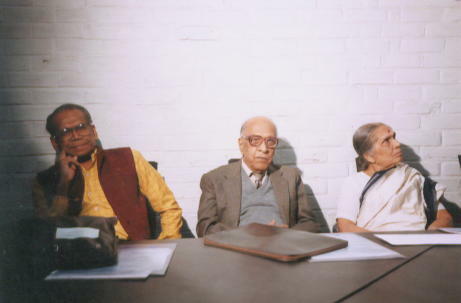 M.N.Roy`s precious thesis was incorporated in it. my article on Indian thought-contemporary Humanist, Rationalist and Atheist movements was included in the Encyclopedia. It was edited by late Gordon Stein.Published by Prometheus Books,USA,1982. It is re-edited by Tom Flynn now. To be published soon by Prometheus Books, USA.